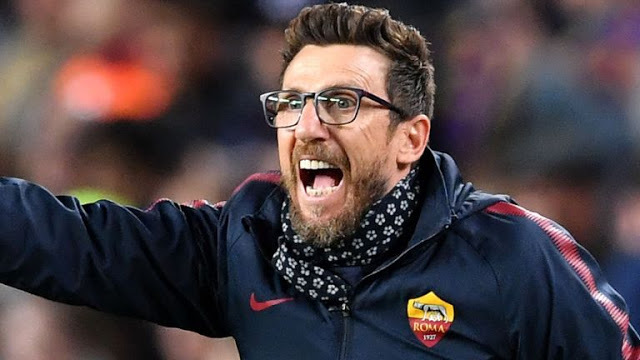 Roma manager, Eusebio Di Francesco hailed the mental strength of his players after they held on for a nervy 1-0 victory over Ukrainian outfit, Shakhtar Donetsk in the second leg of their Champions League 1st knockout stage. Trailing 2-1 from the reverse fixture in Ukraine, Roma knew that a 1-0 win over Paulo Fonseca’s men would take them to the quarter-finals, but they were made to work for it. Shakhtar were resolute in their defending and caused some nervy moments for the Roma Ultras, though the Giallorossi showed character and courage to see themselves over through finish line. The former Cagliari manager believes that his team played the game of their lives to reach the next stage of the money-spinning event. Shakhtar had proved firm in the first 45 minutes, but Roma came out guns blazing after the interval. Edin Dzeko put the home team ahead in the game early in the second half to hand the Eternal City side the advantage in the clash. At this point, Roma knew they would qualify for a first quarter-finals appearance for the first time since 2008, with the dismissal of Shakhtar’s Ivan Ordets in the 78th minute handing them a numerical advantage. In his post-match press conference, Di Francesco said, “This is an extraordinary result because it’s not easy to play at these levels,” “This was a team made up of men who I won’t say played the game of their lives, but almost. “Roma have had the satisfaction this year, despite some difficult times, of getting into the quarter-finals of the UEFA Champions League and we need to be proud of this. And as for our fans – I had goosebumps. “(Now) I don’t care who we play (in the quarter-finals). We need to let this sink in.” he added. Roma have done well under Di Francesco, after many thought they would struggle to replace Luciano Spaletti, who left Roma for Inter Milan. The young tactician has guided the capital club to third on the league table.